Web Based Labor Management Solution. Base system package includes Messaging, Job Costing, and Benefits Accruals. Gain control over labor costs and productivity. 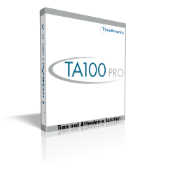 TA100 PRO is an easy to use, powerful labor management solution that allows you to automate your company's timekeeping and attendance tracking. TA100 PRO Software Loading and Single Clock hookup. TA715 Data Collection Terminal with magnetic stripe card reader. A proven performer that addresses a variety Of data collection needs!